Symptomatic of the winter we’ve had, this is the first of two races postponed to this weekend, so numbers were down a bit at Cardingmill, since tomorrow’s Mortimer Trail Race will have attracted some who didn’t want to do both (though seemingly not Flora, who is still considering running again on Sunday). It was a chilly afternoon as we assembled before the race, expecting the threatened kit check (there was even a marshal with a high-viz jacket labelled Kit Check), which however didn’t materialise. Anxious to avoid getting our feet wet so early in the race the five ‘intrepid’ Crofters opted for the footbridge, rather than splashing through the stream, before we were launched on the long climb up Cow Ridge (Calf, I could understand! But Cow?). At the ‘top’ the climb became gentler and gradually levelled out as we crossed the Burway, and then began the gradual descent to Cardingmill Valley. Gradual to start with, maybe, but the last sections are steep, particularly the slither down to the stream (where we couldn’t avoid getting our feet wet!) and then up the other side and the start of three consecutive hills, with one particularly sticky quagmire to negotiate between hills two and three. 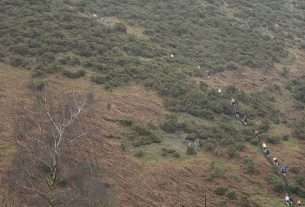 Patches of snow remained in sheltered places, and the paths were often wet and squishy, but we put all that behind us as we watched our footing, descending the last steep valley to the stream, again getting our feet wet (what is it with these fell races?) as we hit the rocky track with about half a mile to the finish. This I always find the trickiest part, as with sweat covered eyes and tired legs I try not to trip on the little outcrops in the path. Finally, yet another stream crossing, with 100m to go to the finish. The race was won by Tom Roo in 43.33, first of the 90 finishers. Irina, who appeared shortly before the start, had set off at a smart pace and managed to hang in there over unfamiliar terrain, to record 58.40 for the 5 mile race, with about 590m of ascent. She was a very creditable 47th and 4th senior lady. I lost sight of her very early on, finishing a good 6 minutes behind in 64.50, first of the three over 70s, in 70th place (running number 708). 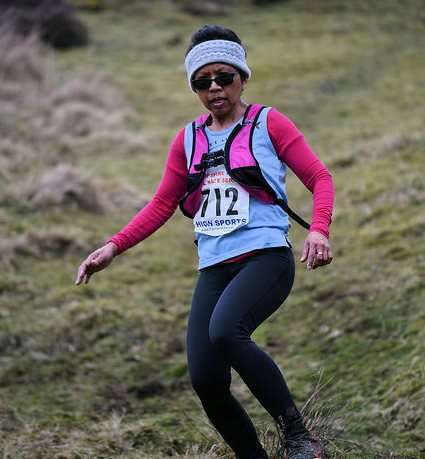 Gary G came home 83rd, in 69.02, with the gutsy Flora not far behind in 88th (72.47), having completed her second proper fell race (are the Shropshire variety quite as ‘proper’ as the Yorkshire, or Cumbria ones?!) in two weeks. Tom (Davies, not Roo), still not fully fit, crossed the line in 78.42. That makes me 1st MV70 over the winter series, and Gary 2nd. Other Croft competitors didn’t complete enough races to have 4 to count over the 6 race series.